Finding good hair products for naturally curly hair, that is more on the wavy side, is hard. Especially conditioners. And curl creams or gels as well, actually. I also feel like it’s a bit hard to find products here in Finland. We have lots of naturally curly haired beauties here, but it’s not really a thing. Usually people want to smooth out their curls and the products are advertised to do just that. Usually with silicones. There aren’t that many “for naturally curly hair” products and lines that are meant to enhance the curls and actually make the best out of them. Or maybe there are, but I have missed them. I am interested in products made especially for naturally curly hair. On top of that, I prefer products that are mostly made with natural ingredients and definitely without silicones. A good conditioner needs to be very smoothing and slick so that I can untangle my hair with it, but it can’t make my hair too sleek – otherwise my curls won’t get as defined. And since you already saw the title, you know that I have good news. I have found great new products for naturally curly and wavy hair. These are actually so far the best that I have tried. And best of all, they are available not only internationally, but in my own country as well. Briogeo’s ideology seems perfect for me. Briogeo’s products are 6-free, meaning that they don’t contain sulfates, parabens, phthalates, silicones, DEA and synthetic color. Now I’m not an expert on ingredients, but I do like to avoid ingredients, that are questionable and possibly toxic (like like phtahalates and DEA). I also feel like some of the ingredients are just unnecessary – like silicones and synthetic colors. These are some of the reasons I prefer using more natural cosmetics. Their ingredients rarely come up negatively in a google search. And as I’ve been using conditioners without silicones, I can definitely say you don’t need silicones to make your hair smooth. 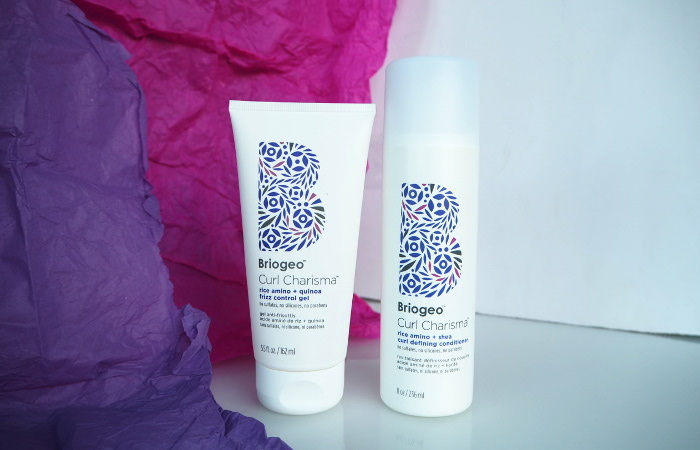 Briogeo’s products are also cruelty-free and mostly vegan. 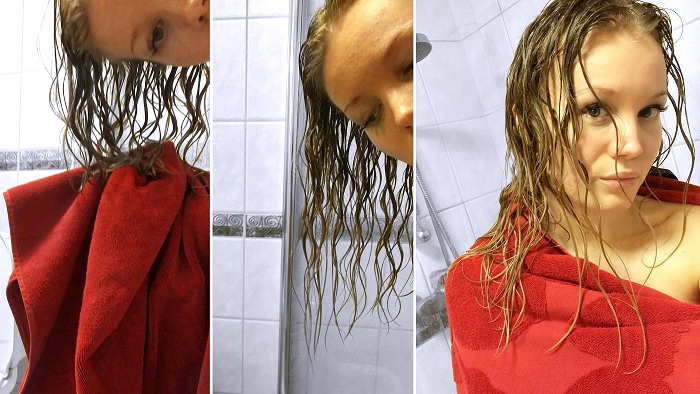 In these photos I have used the Briogeo conditioner and the gel on my hair and let my hair air dry. The Curl Charisma Conditioner is wonderful. It’s made for type 2A to 3C curls. Basically what that means is that it’s for those that get loose waves, to those that get spiral curls. Here’s a good photo to check your curl type. This conditioner makes untangling my hair easy and leaves me with soft hair. At first I thought it was gonna be too heavy for my curls, because it felt so sleek, but it’s actually perfect. Turns out, my hair does need a lot of moisture (shocker for a curly girl, I know). It contains ingredients like rice amino acids, shea butter, quinoa extract, tomato fruit ferment and almond oil that moisturize, protect, create definition and prevent frizz. What I like about the ingredients, is that there’s not too much oils (they are are quite in the middle of the INCI list) and that there’s not coconut oil. I feel like coconut oil in my hair just doesn’t work. All in all, this conditioner is great. I’m so happy I found it! This product, as well, is recommended for type 2A-3C curls. This gel is so nice, because while it gives me some hold, it also seems to give me some shine and moisture. It’s very lightweight and doesn’t really dry down to a stiff cast, as gels tend to do. I would say this is definitely beginner friendly as well, since you can’t accidentally end up with crazy stiff curls. It looks and feels very natural on the hair. It’s very hard to overdo it. I also like that this product doesn’t really have a scent. It doesn’t smell like anything in my hair. How I use it: After shower, I scrunch it on either wet or towel dry hair in upward motions. I also recently bought the Curl Charisma Leave-In Defining Creme and it’s been great as well. If you need even more hold, you could try Curl Charisma Leave-In Defining Creme. That gives nice texture and hold. It’s a bit thicker than the gel, but it still doesn’t leave a cast. It’s a creme, but a bit gel-like. It’s also recommended to use together with the Frizz Control Gel to get the best results. I usually just use one of those though, because I’m scared of using too much of product. Besides these I bought the Blossom and Bloom Conditioner*, because I was curious to see if the other Briogeo conditioners would work as well. And the conditioner is nice! It’s more lightweight than the Curl Charisma one, but it untangles my hair well and leaves it nourished. If your hair is dry and curly, I would still choose the Curl Charisma one. But if your hair is not that dry and gets weighed down easily, you could try this one instead. 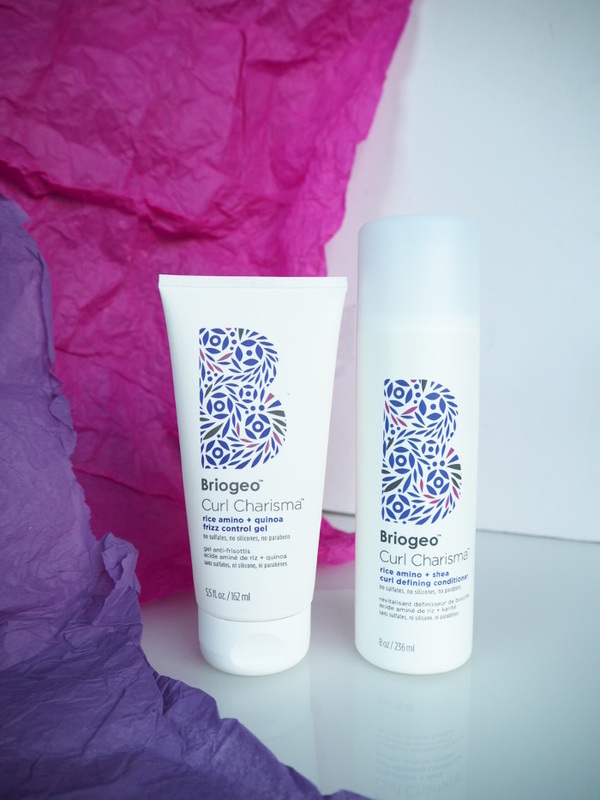 But all in all, all Briogeo conditioners would suit curly hair, since they are all for example silicone free. What are your favorite products for naturally curly hair? I’m on a mission to find lots of great products. Naturally curly and wavy hair. What does that really mean? 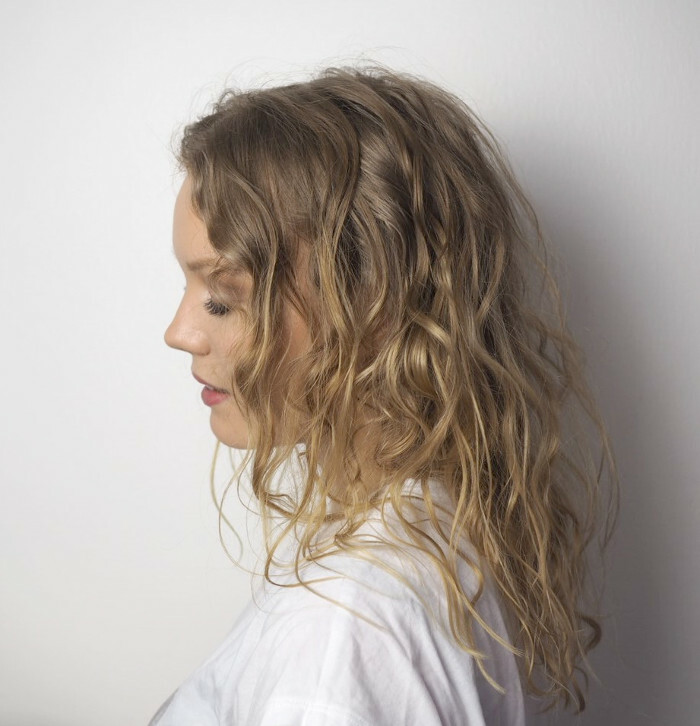 How to know if your hair is naturally curly? Or maybe you’ve always known you had naturally curly hair, but did you really know, what potential it has? 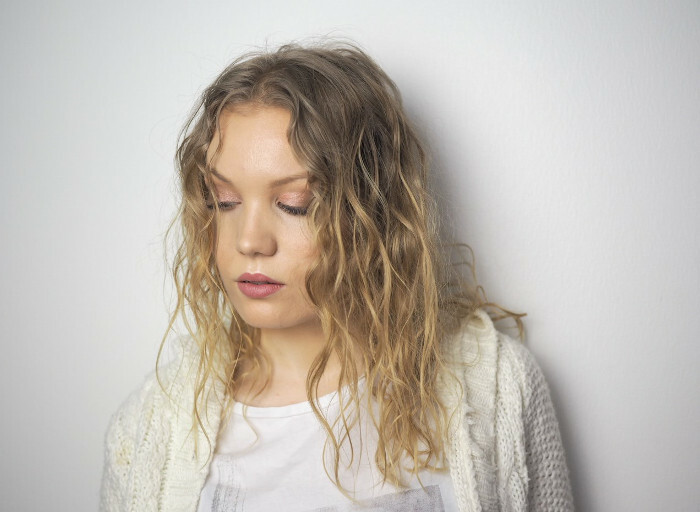 This post is dedicated to naturally curly or wavy hair. 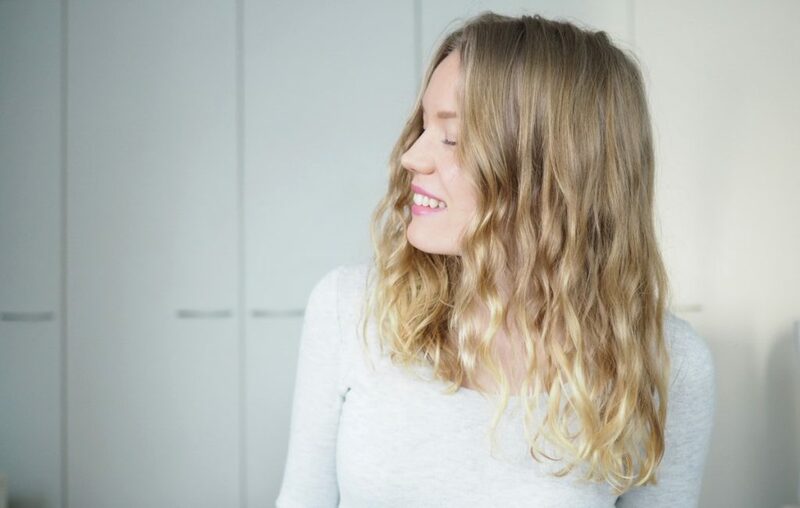 I have gathered some tips on how to treat it and how to get the best out of your curls, without any heat. I also shared my curly hair routine. More often or not, you hear about this one particular problem: your hair is both curly and straight. It’s like a weird mixture of these two. Or it gets more curly around your face – you call them your baby hairs and they have a will of their own. Or maybe you’ve noticed, that on a holiday, say, on a tropical island, your hair is more curly than usual – no use in straightening it. I’m here to tell you, that your hair is naturally curly and you are just treating it all wrong! 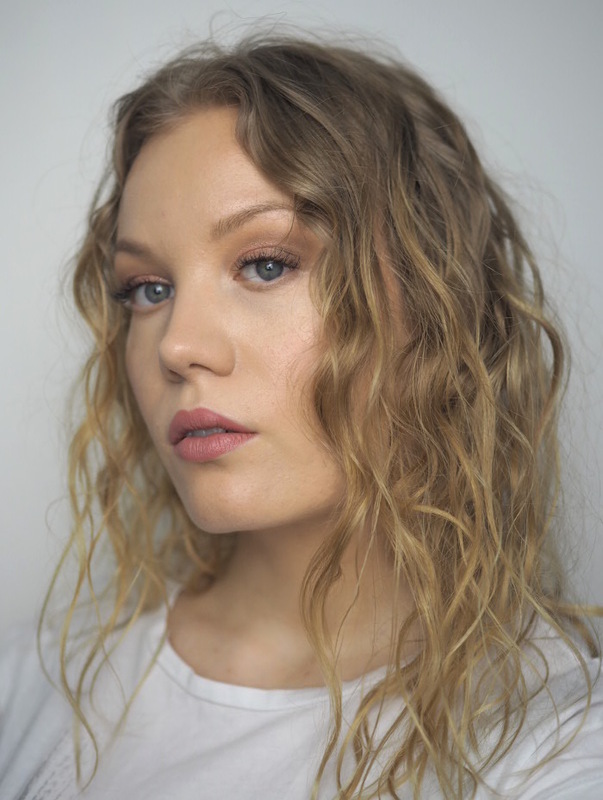 I’m here to tell you, that your hair is not necessarily just randomly curly at some points – it is actually curly, once you give it what it needs! 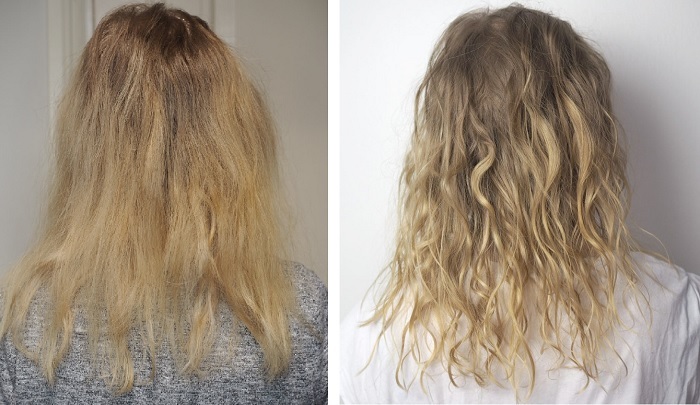 How to know, if your hair is naturally curly? Well, you probably do know. You know deep down, that your hair is and has always been curly. You just haven’t really given it a much thought. But once you do – I’m telling you – there’s no going back. One of the things, that give curly hair away in a second, is getting it wet. You notice it almost instantly, when it’s wet. The wetter your hair is, the curlier it gets. Right? You come out of the shower, squeeze the excess water out, and see it. Curls. Another thing, that’s a bit annoying, but in a way a relief, is that curly hair hates hair brushes. Once you brush a curly hair, it doubles in size. No, actually it triples. It gets huge and frizzy and just awful. It loses all of it’s definition. But don’t worry, I have a better solution to a brush. Also, curly hair is dry. It’s dry by default. But don’t worry, it doesn’t need to look dry. Curly hair is dry, it doesn’t like to be brushed, and it loves water. These things can sometimes be a bit tricky to pick up, because if your hair is full of products not suitable for curly hair – silicone in particular – your hair might lose some of it’s curls and behave, well, not like a curly hair. Or if your hair is super damaged, the curls can be a bit damaged too. But by following these tips, your curls will recover and you’ll find that your natural curls are beautiful just the way they are. 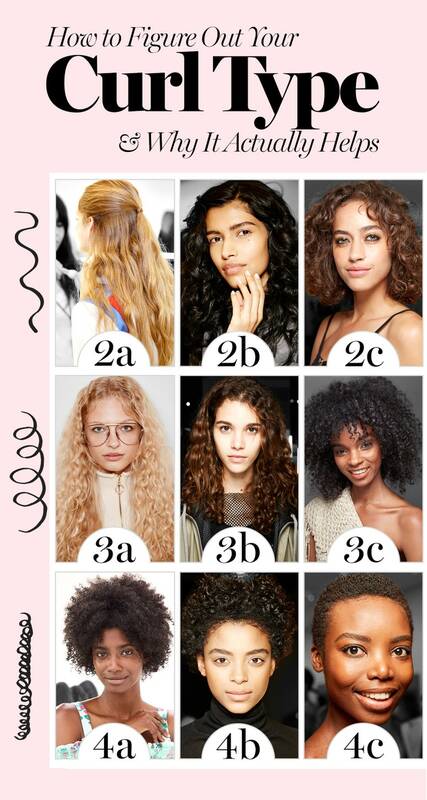 Treat your curly hair the right way! As I said, curly hair is dry by default. So be gentle with it! Stop with the straightening and curling irons. They will damage your hair and your curl patterns, at least in the long run. I hate to go into ingredients, but I have to. I was a bit hesitant to try a sulfate and silicone free routine at first, and to recommend it to you guys, but now that I have, I have to say it’s made a big difference. The reason why this is recommended is simple. Silicones aren’t necessarily a bad thing, but there is a reason they are not recommended for curly hair. Most silicones are not water-soluble, so if you’re using a mild shampoo, it might not wash away all the silicones. And silicones can build up. Once they build up, they can weigh down your curls, diminish definition and straighten out the curls. So it’s just easier to go silicone-free. And hey – even without silicons, the conditioner I use (that is Briogeo Curl Charisma Conditioner*), manages to untangle my hair and make it silky smooth. Why go sulfate free – and why should you choose mild shampoos? Sulfates are detergents and they are used a lot in cosmetics as cleaning and foaming agents. It is recommended to treat curly hair with sulfate-free products. Why? Because sulfates are considered quite harsh, and they can strip your scalp and hair from it’s natural oils. And those oils are actually useful and they protect your scalp while giving moisture to your hair. I’ve noticed, that natural sulfates are slightly more gentle for my scalp. At least they have worked better than synthetic ones. But they can still be too harsh. However, if you’re not scared of sulfates, you might look for natural shampoos that contain sodium coco sulfate. Just wanted to note that here, because I started my curly hair journey with a shampoo containing that. TIP! The easiest way to get sulfate and silicone-free products is to choose organic products. The easiest way to check, if your product is suitable for curly hair (and is silicone & sulfate free), is this is it CG website, where you just copy the ingredient list and the site tells you if it’s CG (=curly girl) approved. Okay – so there were some basic things. Now I bet that you’re eager to start your curly girl journey and try the simple routine. But first, you need to get rid of buildup from products you have been using before. To get the best results and the best curls, you need to wash your hair with a clarifying shampoo once – to get rid of buildup, such as silicones, waxes and petrolatum in your hair. Then you can start the curly hair routine. Note: Even if you’re using products with silicones and are not gonna change them, go for a clarifying shampoo still every once in a while. It gets rid of build-up. Shampoo your hair with a shampoo, that contains no silicones or sulfates. Your shampoo should be mild and nourishing, since curly hair is dry and you don’t want to strip your scalp from all of it’s natural oils – those oils also help your curls. Apply a generous amount of preferably silicone-free conditioner on your hair. You are not gonna brush your hair at all, so this is the part where you untangle your hair using your fingers and the conditioner. You can take your time. Then rinse off the conditioner. Cold water is recommended, but if you already live on the north pole and are not a fan of the cold vibe, go ahead and use warm water (me, always). When you come out of the shower, gently squeeze or scrunch the water out of your hair. Then use the towel and do the same thing. The key here is NOT to dry your hair completely – you just take the excess water out of your hair, but you still leave it damp, or actually damp+. If your hair is very dry and conditioner is not enough for it (with curly hair the chances are that it’s not) – you can add leave-in-conditioners or oils after shower. The right way to apply these products to your hair is – you guessed it! – by squeezing/scrunching the products gently all over the lengths – never drag them through the hair as it can ruin the curls. Again, the products should be lightweight and preferably silicone-free. I have noticed that applying my curl cream to almost wet hair works the best, since it also locks the water in the hair a bit. And then… you let your hair air dry and don’t touch it! And if your hair is naturally curly, it will get naturally curly and dry in perfect (well, maybe not perfect) curls. For a super simple beginner routine, that is it. TIP! 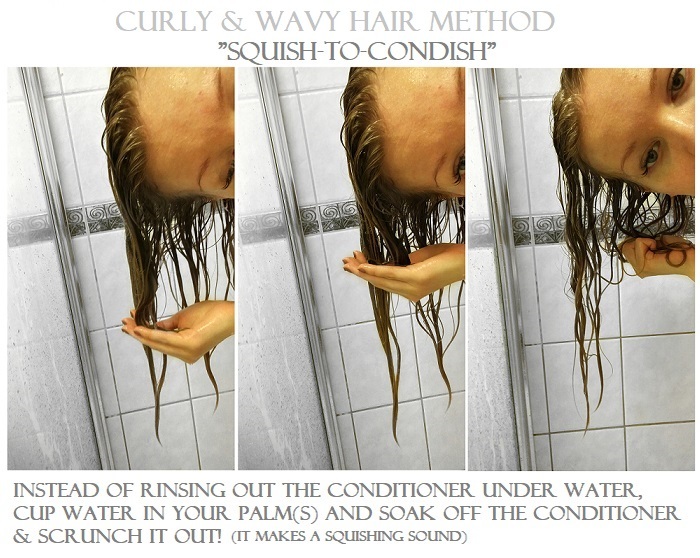 If you have extra time and want to get even more defined curls, you can try the squish-to-condish curly hair method. That means soaking out the conditioner instead of rinsing it all off under water. So instead of rinsing your hair, you take water to your palms and soak out the conditioner in little sections and squish it out of your hair. I follow the curly hair routine and I wash my hair abut 2 or 3 times per week. I sometimes do the squish-to-condish method. I never brush my hair and I sleep with my hair in a pineapple (high loose ponytail), so that my curls don’t get ruined, when I sleep. Last but not least: embrace your curls! I wish I had realized this a long time ago – I would have super healthy hair and curls then. My new love for my curls also goes hand in hand with the promise of growing out my own hair color. Obviously my natural hair is healthier and it will hopefully produce even better curls. I’m also eager to see, if just following this routine and not using heat on my hair will change my hair and my curls for the better. It is said that it takes time for the hair to recover and there is a transition time, which you just need to push through. Personally I am fine with this. I know that my hair is damaged and that’s why there are some straighter curls amongst the perfect corkscrew ones, but I was never about perfection anyway.